The best-looking, least intrusive wearable device yet − but what's it for? While versatile and beautiful, Shine succeeds as a novel fashion accessory but largely fails as a monitor of meaningful health metrics. Activity trackers are predicted to explode in popularity, but to become accepted by the masses, the chunky child-like designs of the likes of the Jawbone UP and Nike FuelBand have got to go. So far really only designed for athletes, wearables need a mainstream makeover. Now available for £80 / US$120 / around AU$135, it's not overly expensive either, although the accessories are a little pricey, given some cost nearly half that of the main unit. 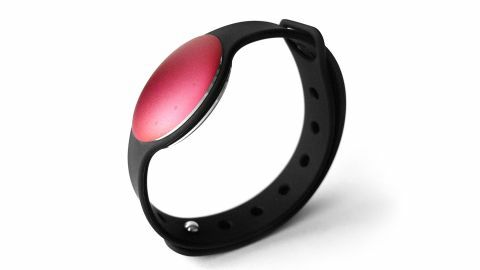 Misfit Wearables thinks its Shine is just that. A coin-sized sensor designed to collect data on your activity, while also offering basic watch functions, the Shine looks less like an athlete's accessory, though it retains most of the functions. The grey, silver or black aluminium Shine is a mere 9g in weight and no bigger in diameter than an average coin. Looking more like (unisex) jewellery than gadgetry, out of the box it can be worn in either a flat-profile silicone wristband (that adds a whopping 7g to the package), or in a tiny clasp. When attached to the wrist it's comfy and doesn't slide off. Easily slid under a sleeve, but looking like anything but a watch, there's no doubt that the waterproof (to 50m) Shine is eminently wearable. The clasp offers another way of wearing Shine − just slot it into the silicon surround and the magnetic fold-over clasp means it can be hooked to anything, most likely a belt loop or laces on a shoe. I did both and found the magnetic fixing very strong. In practice, however, the Shine's design is a double-edged sword. I love that it's waterproof, so fine for wearing in the shower, but at some stage you're going to want to remove it and put it in the clasp. That might seem like a great idea, but in practice it's a really bad decision. You see, being small and hardly noticeable has its downsides, and I found that during the two-week test when the clasp was on my jeans, I forgot all about Shine for at least half the time. Consequently, it didn't get the chance to record my sleep as much as I'd planned it to, and four times it was left at home while attached to the wrong trousers. Naturally, on two of those days I went for long walks, not a single step of which was recorded on the app. This is what happens when you live with wearables. Where I will heap praise on the Shine is its battery. It uses a CR2032 battery that will last for around four months – that's far more handy than most activity trackers, which need to be attached to a USB port every few days to refuel. However, communicating with a smartphone via Bluetooth puts Shine ahead of some activity trackers. It might not look like other activity trackers, but the Shine isn't much different to the sports-centric wristbands available for lower prices – it's just less serious, and in lots of ways. Shine records your physical activity and sleep. It claims to be able to recognise the difference between various different sports, including cycling, swimming, tennis, basketball and, er, soccer. Aside from the fact that calling football "soccer" is wrong and bad in some countries, it's a very US-centric look at sports. Anyway, two glaring problems exist here. The first is that any work done in a gym can't be counted or added to Shine's statistics, making the entire device rather pointless for gym-goers. It's not alone in this problem, but that's no excuse. Worse, Shine doesn't actually recognise any of those sports at all − it merely has algorithms inside to help it average-out movement. We know this because it's necessary to physically choose the sport you're about to indulge in from a list in the app's Misfit Labs area's (i.e. beta-features) Activity Tagging page. Three taps of the Shine and whatever activity was selected last is supposed to be recorded, though in my tests I had to almost hit the Shine to get it to register anything. However, the main problem with this approach is that one of the activities in the list is Sleep, which means that you'll have to delve into the app at least once a day, before bed, to re-set that activity to Sleep, then back again in the morning if you're out cycling, say. Bluetooth or not, that's a big yawn, though it does appear to self-select walking if you do nothing. I had the same problem with swimming, which I had hoped would be the Shine's ace-card. Despite triple-taps while in the deep end – on three separate occasions – the Shine failed to keep any record of my swimming. Motivation on the Shine is lax; you'll get no 'well done!' messages or warnings about inactivity, though a double-tap and some of its 12-strong ring of LEDs light-up according to your progress. Once it's shown you that, Shine shows you the time using those 12 LEDs to represent hours, then minutes. I was baffled by this, and wondered if it was some kind of binary language. C-3PO could probably understand, but I doubt that even he has 20 seconds to spare to stare at some lights whenever he wants to know the time. It took me two weeks to figure out that it was an hour fast, and the irregularity of the tapping meant that the Shine can't be classed as a watch substitute. The free Shine app for iOS and Android phones (selected models that run Android 4.3 and over, and have Bluetooth 4.0) was recently updated to include a Facebook dimension that can compare your stats with friends and the world at large. I couldn't care a jot what the rest of the world is doing, but the optional push notifications notifying you what your pals/bitter rivals are doing might help some. Syncing Shine with the app is easy, though can be slow. You're supposed to tap Shine onto the phone itself, though that's not really practical – instead I managed to sync it over Bluetooth from close-by, though it can take a while, and often timed-out during testing. We can't deny that placing the device on the phone screen and seeing it begin a connection is cool, and uses some proprietary technology - but it's a novelty that wears off in place of speed and ease of use. The front page of the always portrait-orientated App is so basic. A Today read-out includes a 'last synced' time above a dial that's exactly the same size as Shine. Around the edge is an orange line that represents how far you've walked as a percentage of your daily goal, which – rather confusingly – is measured in points. So, about halfway through a normal day I synced the app to the device to discover that I'd earned 415 of 1,000 points so far. Huh? I'm not really sure what to do with this information, though it does say underneath that I've got 'about 1 hour of walking left'. That's genuinely useful, and did – on one occasion during a particularly lazy Sunday – cause me to go out for a walk. Shine did its job there. Tap the dial once the day is over and you'll see stats for points earned as well as steps taken, calories burned, and miles walked. Below this dial is an at-a-glance graph of your daily activity, which also doesn't give us much insight – it's all very basic. Drag a finger up and some icons are revealed that represent either Activity (orange), Sleep (purple) or Milestone (green) for reaching goals. In my test, a single day had six boxes in varying intensities of orange that represented about 15−20 minutes each tagged with statements like 'kinda active' and 'pretty active' to 'very active', with each carrying a points award. By the end of the day I'd reached my 1,000 points goal and was awarded a 'milestone' cup that stated "You hit your goal. Sweetness!" On one particularly active day I got to double my goal and achieved a 'personal best' award. Now what? With no sign of any recommendations, or advice that we should change our goal, I'm not sure what else to do with this data. Walking appears to be the default interpretation of any physical activity, with sleep not recorded unless the bedtime triple-tap is recognised, though, as with swimming (or cycling or soccer) you won't find out until morning whether it did understand your instructions. When it does, all you get is a purple icon with basic figures for total time spent asleep and how long deep sleep lasted. Enter that icon and you'll see only a simple graph that's of little use. If you want to gain insight into your sleep patterns, go for a smartphone app like SleepBot or SnoreLab − the Shine offers virtually nothing.